"Laddish, brutish, debonair: he goes from rugged and dishevelled to boy-next-door in just a few changes"
British actor and renowned bad boy, Tom Hardy is going through a career boon presently, but you mightn’t know it has spanned close to two decades—and a high-profile one at that. His screen debut was Black Hawk Down, continuing on an upward trajectory since with appearances in The Dark Knight and Mad Max: Fury Road with Star Wars: Episode VIII to come. What an undercover achiever. His style game is just as on point. Laddish, brutish, debonair: he goes from rugged and dishevelled to boy-next-door in just a few changes. But while he might be talented on the big screen, he excels off it in the fashion stakes. Hardy has a calm-and-collected cool that one should expect of male stars today. While appearing effortless, each outfit has a common thread tying each look together. 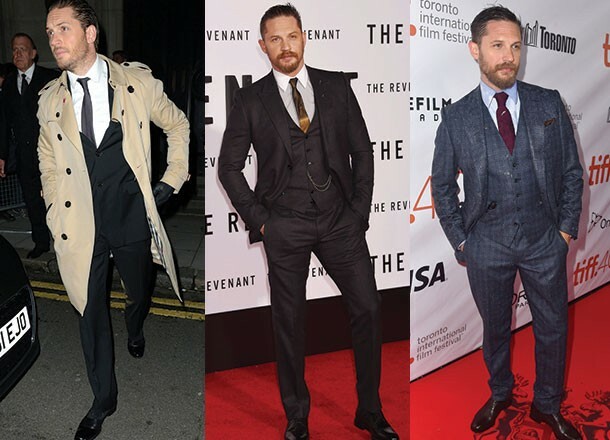 Whether it’s on the red carpet or on the street, Tom Hardy’s look has tailoring at its core. Taking classics and reworking them by styling them in a relaxed manner, he has a signature style without compromising his essence. One to favour a waistcoat, Hardy keeps it simple with British attitude. For Cannes press conferences Hardy goes for a smart casual look: a single-breasted navy blue suit, simple leather and brass belt and navy shirt. The striped placket adds another texture to the overall look, likewise the pendant worn around his neck. It’s a comfortable look for the Cannes heat, particularly when grilled by journalists all vying for his attention. Charcoal wool flannel trousers and matching waistcoat with AMF stitching worn with a short-sleeved shirt with a button-down collar has an edge. It’s a buttoned-up, unconventional look, but somehow it works. And how else is he meant to show off his guns? A trifecta of tailoring (from left to right). A classic Burberry trench coat with a black suit and charcoal tie; a look favoured by many Hollywood gents: Bogart, Connery and now Hardy. A three-piece suit is everything and Tom wears it well. The white collar with the grey shirt is a subtle touch, the bronze tie complementing his colouring, but it’s the fob chain here that steals the show. Three-piece plaid is not a look for everyone, but when it works it works! A complementary burgundy tie to the navy-and-blue check worn with a pale-blue shirt, black polished shoes and he’s ready to work that festival circuit.